Maylandsea Bay Week over but there is still plenty of sailing to be done. Plus the August Bank Holiday Regatta and Sandhopper Open 25th -27th August. Next Training Day Saturday 1st September. Please see below for details on upcoming events and the latest news from the club. Deep clean veranda - cob web remover!! Clean Veranda roof - this needs to be done safely eg walking boards and long reach cleaning brushes. mops, squeegies etc...- Gary will manage this. Straighten and weld the jockey wheel bracket on MB1 trolley - has anyone a welder they can use? It's not too late to sign up for some or all of Maylandsea Bay Week, details are on the club website. Welcome to all our new members. Hopefully you have all had a chance to get out on the water. If you are wishing to crew for someone on a race day please put your availability on the Facebook page. Thanks to the members who made this a highly successful day - the conditions were perfect and we took 60 guests out, with a number of families and adults joining. We have now had 4 sessions this year, the first 3 in relatively calm conditions but session 4 was a bit breezy with some very challenging gusts. Looking at the grapshs on our new weather station the wind did exactly what is was forecast to do - gusting 27mph. Session 5 - Saturday 14th July. Again perfect conditions - 6 dinghies, 2 cruisers and the rib went out on the morning tide and back on the evening tide. We went up the Strood this year in amongst the moored cruisers and then moored at the Kings Hard which meant a shorter walk to the Victory Pub for lunch. Always good to see the looks on people faces when we walked in in jackets and suit - life jacket and wet suits! Phil has posted a video of the day on the Facebook page. We have changed the recall lights to make them more visible - same colour as before but they no longer flash. Maylandsea Bay week, Kestrel and Hornet nationals, Kestrel and Hornets at MBSC, Barts Bash, Training regatta....... Prize giving dinner (new date 1st December). Please see programme and website for more details. The post war boom in sailing saw many designs of wooden boats produced - Mirrors, Enterprises, GP14's and such like. The club has had many wooden boats, but they did need regular maintenance and wouldn't withstand a blow from a plastic boat. I believe that we now only have one all wooden sailing dinghy left - Craig's solo. Read the BJRC News for the 2018 Smith Cup. results. I hope you've all been enjoying the nice weather and if possible have had the chance to get out on the water. There's a number of things to get through this month so here goes. Thanks to all those who turned up on Saturday to help move boats, paint the hand rail, prepare race marks, etc Your help is invaluable in maintaining the club. Training - Saturday 28th April 10.00 a.m.
Just another reminder that this year's training sessions begin this coming Saturday. Paul and the team will be delighted to see as many people there as possible. For further details please contact Paul Wilkinson. Saturday week is our annual open day and as usual we are asking as many members to turn up and help out as possible. There are numerous jobs that need doing on the day so please make every effort to support whether it be on shore or out on the water giving our guests sailing experiences. Members are requested to arrive at 12.30pm in order to get organised before the public arrive. As usual feel free to invite your friends. Thanks to all those who have already paid their membership renewals but for anyone who hasn't please can you pay them soon. I'm sure you'll have all seen the Maylandsea Bay Week Committee's invite that was sent out over the weekend. The dates this year are 23rd - 27th July and the theme is festival. It's a great week of sailing, activities and entertainment for a very reasonable price so why not come along and enjoy the fun? The club has been and is successful because members are supportive in carrying out their duties as agreed when they take up membership. To ensure that this continues please ensure that you attend when your are programmed for a duty or arrange a swap through our Facebook page or any other means. Please advise our sailing secretary Phil Spillane if you're having a problem covering your duty. Unfortunately the Royal Corinthian Yacht Club is unable to provide a room on the published date so the Prize Giving Dinner has been pushed back a week to 1st December 2018. Finally we're delighted to inform you that Josie has agreed to take over the running of the galley so please offer your support to her whilst she finds her feet. Following the cancellation of what would have been our initial weekend's sailing due to the weather we are hoping that there will be no return of The Beast from the East and that we can get underway with the first racing at 11.00 am on Good Friday. There's racing planned for all four days so please come on down (details in the programme). Unfortunately we do not currently have a galley hand following Beth's decision not to continue. If there are any volunteers who are happy to run it on any of the days across Easter then please let us know and we will ensure that we get some provisions in. If we do not get any volunteers then we will provide some milk for you to make your own teas and coffees but we do ask that you leave the money on the plate below the urn. Please remember to do your own washing/drying up as we do not have a team of magic fairies employed to do this. Due to changes in employment law the committee are currently considering what we can do regarding the galley moving forward. Please check the programme to see when you are scheduled for duties and if you're unable to make that date arrange to swap with someone else using the process documented on the back of the club programme. The club is delighted to announce that we now have a weather station installed at the club which is available to view online at www.mbsclive.club . The details update every 15 seconds so why not check what the weather's doing before you leave home. Click on the top link on the page to see the gauges There's also details at the bottom of the page of an available app for those of you with an iPhone. We would like to thank Geoffrey Walkley and his son-in-law Mark for building and installing the station. We have agreed with Harlow (Blackwater) Sailing Club that they can join in with the training sessions at MBSC this year. The land that currently houses the cruisers will be given back to its owner so we have a small move that needs to take place in the west dinghy park. All dinghies in the final row before the Sandhoppers will require moving either by their owners or other members to alternative locations in order for the Sandhoppers and cruisers to be moved across. These moves will start over Easter and will continue at the first work party if required. If your boat is moved and you're not in attendance we will let you know via email where it has been moved to. Welcome to the last of the Autumn newsletters. It must be winter soon as the winter open series begins next Sunday 5th November at 11.15am. 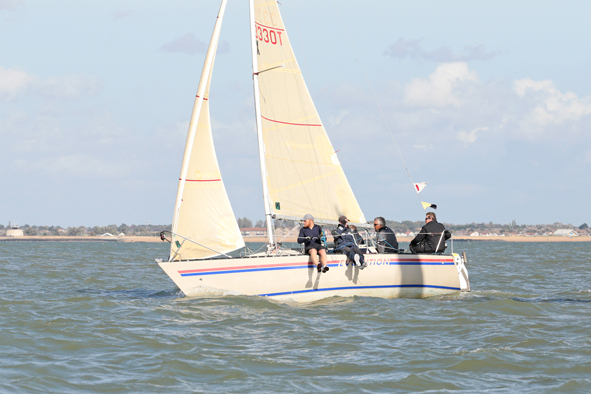 Details of the series can be found in the sailing programme and on the website. Remember you can invite your friends from other clubs who can bring their boats and enter the entire series for a nominal fee. Annual General Meeting - Sunday November 12th 11 a.m. - come and join us to hear from the committee about the past year at the club and the upcoming one. The meeting will start with a minutes silence as it's Remembrance Sunday. Prize Giving Dinner - Saturday 25th November 7.30p.m. - join us at the Royal Corinthian Yacht Club in Burnham-on-Crouch for a three course meal and the annual prize giving. Details can be found here. Don't forget that Paul Wilkinson requires your money and menu choices by next Sunday 5th November. As the Cadet Captain at Maylandsea Bay Sailing Club, I sail all year round, taking part in the series racing and the sailing training. At the beginning of the year, many of us brave the cold of January, taking part in the winter icicle out on the river. This year I took part in the race with Glenn Enkle in a Lark, which I also compete in throughout the rest of the year. For the rest of January and February, Glenn and I competed in the Icicle series at Alton water in Suffolk, against roughly another 100 boats, we placed 33rd overall. The Maylandsea Bay sailing officially begins at the end of March/start of April and I started the season sailing my Laser Pico in the spring short handicap fleet against some cadets from both MBSC and the Harlow Blackwater Sailing Club. At Easter I sailed the Pico and camped over for the weekend in the dingy park, which I did several other times throughout the year. The sailing club and the people here help me to gain experience and give me opportunities such as in May, competing at Marconi Sailing Club in the Lark open or during mid-September in the Hornet and Kestrel open here at MBSC. In the summertime I helped out with the training sessions, doing practice racing and advancing the cadet's skills. There were seven sessions to attend and a regatta weekend of racing in September with prizes for those who competed. During the summer I raced the long course races with Glenn up until Maylandsea Bay Week (MBW) in mid August. As a cadet I enjoy the training sessions and MBW the most and during the week this year Beth Wilkinson and I were able to try sailing in a Lark on our own in the long course fleet, whilst also camping and enjoying the entertainment. For the rest of this year I've sailed with Glenn in the Autumn series and we will soon sail the Winter series up until the end of December. Last year was my first time competing in the Winter series so I'm really looking forward to it this time. The winter series is an open series where I enjoy racing against a variety of boats and people compared to the rest of the year. My year's sailing is made all the better by the people at the club and gaining more experience from time on the water and the advice that's freely shared. What a great Maylandsea Bay Week, well done to the organising team lead by Lisa Pollard and Jules Dawson. After many years Paul and Sally Gray have stepped down from the committee – thank you for all your input and creativity to make MB Week a success over a number of years. What is pleasing to see is the number of sailors who have competed in the week who have in recent years attended the Saturday training days. As a club we need to ensure we create capacity for the new members to get out on the water, either as crew or running short course racing. In late August the short course held four races in a day with a committee boat start, which makes me think that we should try this approach for some of the race days in the 2018 programme. Harlow hosted the summer series for dinghy races and a number of cup races. Anyone who did the Hells Bells will know it was quite an experience when the big squall came through. With my crew Dave Ashdown we were planeing nicely off Osea but the boat went away from me and in we went. I blamed it on weed on the rudder and inability to steer. One of our Sandhoppers Wild Gull went on to win the Hells Bells. There was a great sight in early September with 5 Sandhoppers all with their kites up heading towards number 4 buoy where the Sunday start for the Kestrel and Hornet open took place! Thanks to all those who helped out that weekend, it was quite busy with committee boat starts, flags and hooters. We had a few guests and it is good that both classes want to race at MBSC and enjoy the Blackwater. Two of our Kestrels went to the Nationals on the River Tay and two Hornets went to north Wales for their event. Next year the Kestrels and Hornets have a joint nationals at Thorpe Bay – right on our doorstep. Last weekend 7 MBSC boats set off to participate in the Blackwater Barts bash. There were less competitors this year probably due to light winds, an early start and lack of publicity but those who sailed had fun and the club was well placed with 6 of the boats finishing in the top 20. The competitors donated £24 on the day for the Andrew Simpson Foundation which the club has matched. Monies this year were going towards victims of Hurricane Irma. Small things keep the club going like Kenny Hobbs digging out the bottom of the west ramp – it allows for early launch of the safety boats and slightly later recovery. The committee recognises that numerous people continue to undertake “jobs” to keep the club running – thankyou. This is probably how small clubs work but the work party days are essential when larger “jobs “ need to get done. The early July party repaired the ramps and sea wall and added to the hard standing in the safety boat compound. There is more to be done at the October work party. Looking forward we have the AGM in November with a number of committee positions to fill; the prize giving dinner on the 25th November and Christmas Party December 10th. We are starting to look at the 2018 programme so if you have any requests then speak to Phil Spillane or Dean Saxton. Having mentioned weed earlier – will it be the saviour of the creek and stop the mud moving around or just mean you have to clear your keel and rudder more often – answers on a post card!! There is more sailing opportunities this year – Autumn Series, Winter Series and the Blackwater Icicle in January –so get out there and sail. I have tried to keep this piece short and have decided not to include a piece on the hunt for the GoPro camera but watch social media for more footage. As all members know we are a self help club and therefore can the committee ask for your cooperation with the following matter. If the galley has closed or isn't available on any particular day can members please do their own washing up as it is unfair on the committee or indeed other members to have to wash up after other people. That's all for now, see you at the club soon.